Charles N. Love, Editor of the Texas Freeman. Image available on the Internet and included in accordance with Title 17 U.S.C. Section 107. LOVE, CHARLES N. (1862–1946). Charles N. Love, black newspaperman and early supporter of black civil rights, was born in 1862. In the early 1890s he worked as an agent to develop larger circulation for several newspapers, including the Austin Texas Citizen and the New York Age. In 1893, with Emmett J. Scott (an agent for the Houston Post), and Jack Tibbett (a railway mail clerk), Love organized the Texas Freeman. Even though the newspaper was intended for black readers, he financed it with white subscriptions. He received further financial backing from a white mayoral candidate, Baldwin Rice. In the Houston elections of 1896 the paper supported Rice for mayor. In return for black support, the Houston Democratic Executive Committee allowed blacks to vote in a night primary mounted specifically for African Americans. Rice won the election. 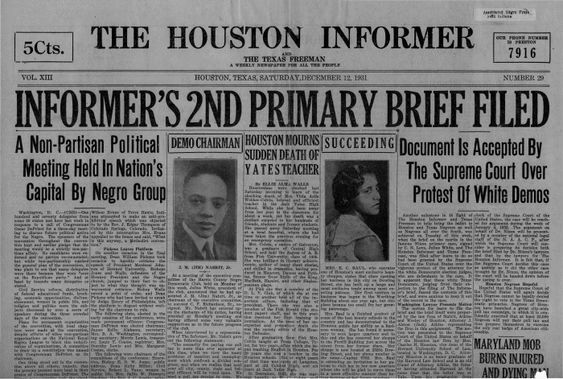 Front page of The Houston Informer and Texas Freeman from December 12, 1931. Image available on the Internet and included in accordance with Title 17 U.S.C. Section 107. From its inception the newspaper took on numerous controversial issues. In 1894, alarmed at severe treatment inflicted upon black prisoners arrested by the Houston police, Love successfully led a fight for better treatment. In 1911, to protest a Houston ordinance prohibiting "colored people" from hitching their horses and teams on downtown streets longer than thirty minutes, Love purposely violated the law by leaving his horse in the prohibited area for eight hours. After being arrested, he persuaded the city council to revoke the ordinance. During World War I he continued to criticize the treatment of blacks by city and county officials. In 1917 a "special commission" of Houston and War Department officials summoned Love to appear to answer charges of hindering the war effort. After he defended himself, the commission cleared him of all charges. Love's Column, "The Man About Town," in the Texas Freeman. Image available on the Internet and included in accordance with Title 17 U.S.C. Section 107. Through his column "The Man About Town" Love often voiced his opinions about black civil rights. The white primary became one of his major targets. He sought to overturn the Terrell Election Law of 1903, which allowed local party officials to exclude blacks from voting in primaries. In 1921, Love, William Nickerson, Jr., and several others filed suit against G. W. Griffith, chairman of the Harris County Democratic Executive Committee, in an effort to overturn the law. Love v. Griffith eventually made it to the United States Supreme Court, which decided against the suit on technical considerations. Even though Love lost the case, he had set in motion a twenty-three-year struggle by Houston African Americans against the white primary in Texas. Love retired from management of the Texas Freeman when it merged with the Houston Informer in 1930. He remained active as an editor until his death, on September 10, 1946, in Houston. He was survived by his wife, Lilla. See also HOUSTON INFORMER AND TEXAS FREEMAN. Charles William Grose, Black Newspapers in Texas, 1868–1970 (Ph.D. dissertation, University of Texas at Austin, 1972). Houston Informer, July 21, 1937, September 4, 1937, September 14, 1946. Handbook of Texas Online, Douglas Hales, "LOVE, CHARLES N.," accessed April 24, 2019, http://www.tshaonline.org/handbook/online/articles/floac.